made up in a range of sizes. Print your logo onto these custom printed spring water bottles 350ml or one of our other innovative spring water bottles and use them in your next marketing campaign as a unique giveaway item. These practical promotional products are an effective way of promoting to a broad audience. Everybody has a need for water, so everybody has a need for a spring water bottle! Promotional Spring Water Bottles are an innovative way to promote your brand, and will make a wicked addition to any Summer, Athletic, Children's or Health promotion. 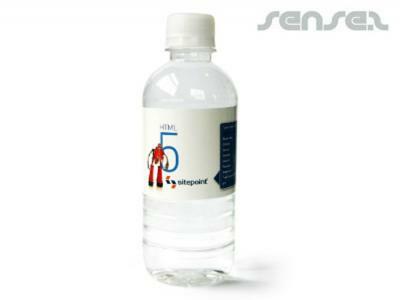 Promotional spring water bottles have your custom label printed in full colour, with a 350mL capacity. Prices include full colour digital print. ***Please note 350ml bottled water can only be purchased in multiples of 24 units. ****We can do these 350ml bottles with a white, red or black cap. Container Deposit Legislation is applicable for all bottled water in SA, NT, NSW, QLD & ACT. Please use our approved label templates for bottles you intend to distribute in these states. Bottled Water without an approved EPA 10 cent refund marking will be in breach and fines may apply under State law. To Apply this label the government charges us $0.16 per bottle, please add this to the cost price of our standard bottle prices for the bottles you intend to distribute in these areas (we will mark the cartons clearly for you). Other innovative corporate gift ideas that could be suitable to create brand awareness include these cheap promotional Personalised Spring Water Bottles 350ml, quirky advertising gifts such as these Custom Sparkling Mineral Water (330ml) or how about using one of our more bespoke custom made products such as these great quality Spring Water Bottles 600ml? Custom brand these spring water bottles 350ml or one of our best-selling promotional spring water bottles with your company logo! Personalise your spring water bottles 350ml or custom design spring water bottles for your marketing campaign. How can these unique promotional spring water bottles 350ml or our personalised spring water bottles fit in with your marketing strategy and help you maximise your brand exposure? Our custom made Spring Water Bottles 350ml can be produced from a minimum quantity of 100 pieces. We can have your logo branded on these corporate Spring Water Bottles 350ml in Full Colour Digital Print. A setup fee of AU$180.00 will apply to make the film.